The year I went off to university in Tokyo, something fateful happened when I returned home to Shikoku for one of the last in a series of traditional Buddhist services for my father. 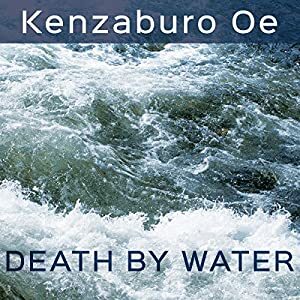 -- Death by Water by Kenzaburo Oe. Don't think from the title this is a mystery! If I weren't trying to read at least one book by every Nobel Laureate for Literature, I don't know that I could get through this one. It's pretty heavy sledding. I enjoy it for the most part, but then that part repeats itself over, and over, and over. You're very brave. I don't think I could do that. Reading is too much fun. Good luck, and hope you do find pleasure in it. Bravo for you making a go at DEATH BY WATER. I wonder if it would improve in the audiobook edition so that the vocabulary wouldn't trip you up as much. Great challenge to read all the Nobel Prize winners. Good luck getting through this one. If you've not read him yet, I'd recommend Halldór Laxness next. I love his works. That's great that you got through it. I have to admit, by the title I would have thought it was a mystery. Just goes to show you :) Have a great weekend! Hope it's worth the struggle in the end. Sounds like a challenging project. I love the idea of this but am not sure if I could stick to it. This sounds like slow going! Is it a translation issue or just the story itself? Anne: Yes, I'm finding that the audiobook is much easier to handle. Nicki: I read Independent People by Halldór Laxness and enjoyed it very much. Also slow, but very interesting. ER: Thanks for joining us!